Cattle crammed together. 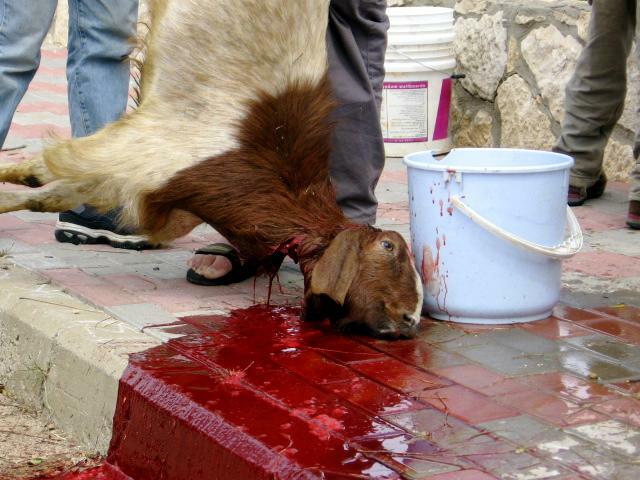 One goat slaughtered mercilessly. The other animals trying to escape. Those are the scenes of a video, about the slaughter of animals in an abattoir in Mauritius, which ELI Wooff posted on its Facebook page. With over 19 000 views, this video revealed to many people the traumatic experience animals who are forced to sacrifice themselves for human consumption undergo. This clip is however only a microcosm of what many animals undergo day in day out in slaughter houses in Mauritius. While many people would say that the method used to kill the animals in the video ensures that the latter do not feel pain, the video shows the contrary. The agitation of the goat and the stressful conditions under which the animals are kept all point towards the distressing experience the voiceless beings undergo before ending up in our plates. This is not the first time video footage which depict animal cruelty in Mauritius are released. Several investigations led by international organizations raised concerns over the treatment animals imported for human consumption receive in Mauritius. An investigation led by Animal Australia in 2013 showed how Australian cattle in Mauritius are ill-treated prior to being slaughtered. Still then, the government did not feel it necessary to act and improve conditions under which animals are kept and killed for human consumption and for other purposes in Mauritius. While the best solution to prevent this cruelty is not to kill and to ban live export of animals to Mauritius, the solution for the time being is to kill the animals in a more humane way. The RSPCA definition of humane slaughter is: ‘an animal must be either killed instantly or rendered insensible to pain until death supervenes’. This means that when animals are being killed for food, they must be stunned prior to bleeding out so they immediately become unconscious. In Australia, the national standard for meat production requires that all animals must be effectively stunned prior to slaughter and we believe that this should be the case in Mauritius. At ELI Wooff, we oppose all forms of slaughter that do not involve prior stunning of the animal. If we want to respect the rights of animals as sentient beings, it’s time for us to make our views known and urge our government to make Mauritius a more compassionate country. In the meantime, we can be the change by maybe considering our diet.